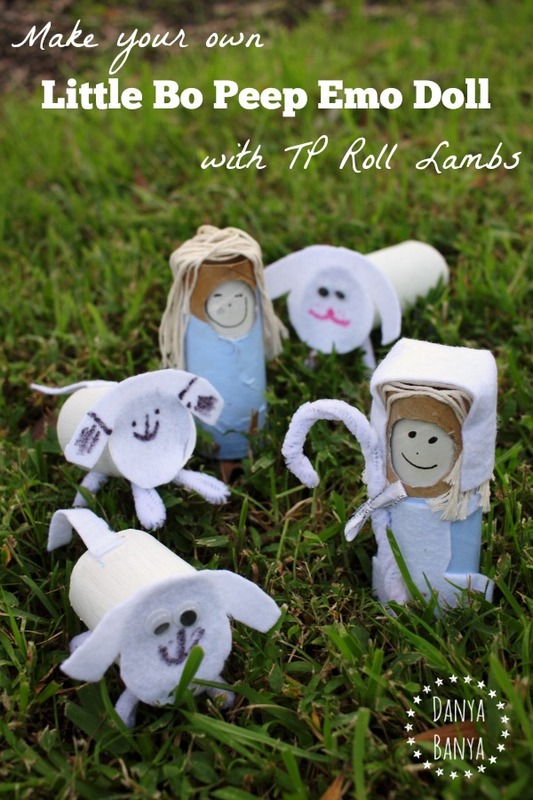 Cute nursery rhyme activity for kids: make a Little Bo Peep doll and sheep using toilet paper rolls and other items you probably already have at home. Great for role-playing, as Little Bo Peep’s expression can change from worried to happy when her lambs come home, with tails wagging. 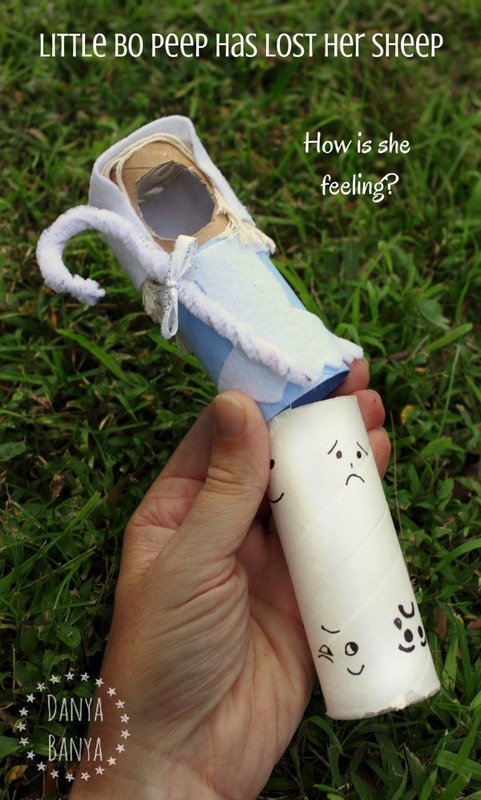 I thought about poor Little Bo Peep, and how worried she would feel to have lost lambs, and I knew this is a perfect fit to be the latest ‘outfit’ for our Emo Dolls. 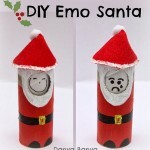 (If you haven’t heard of these dolls before, pop over to this post showing how to make an Emo Doll. 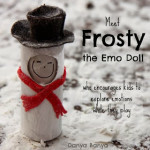 Emo Dolls encourage emotional intelligence, as kids can select and change the doll’s facial expression whilst they role-play. 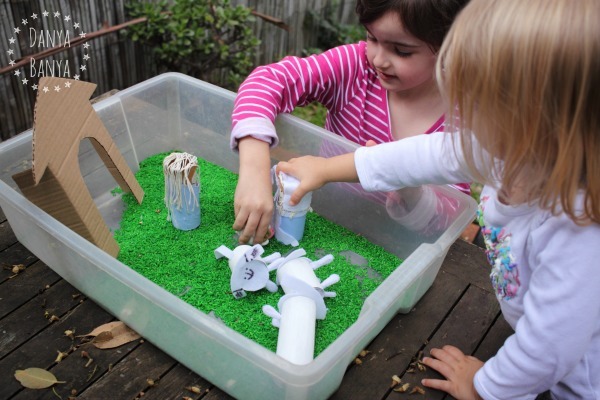 They’re a great way to help kids explore emotions and empathy through play). 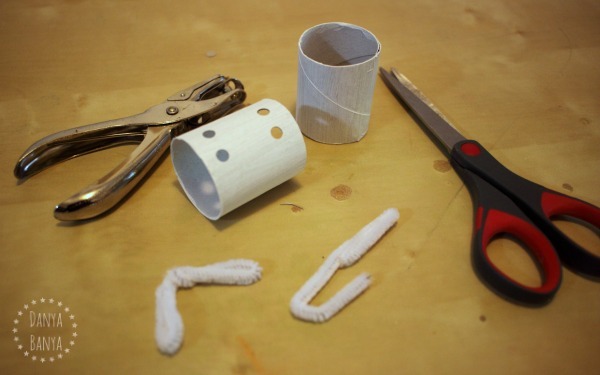 If you’d prefer, an alternative to toilet paper rolls is paper towel rolls cut to size. 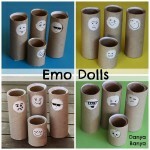 You can also buy ‘craft rolls’ from some craft supply shops. 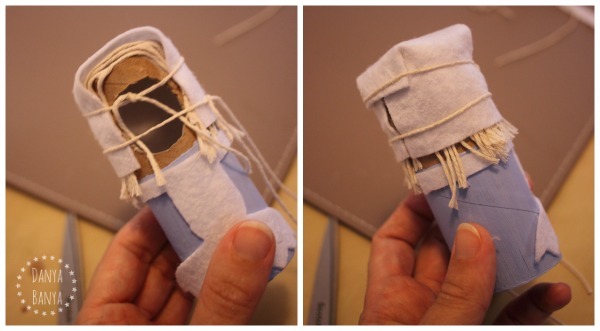 Wrapping paper rolls can also work, but you’ll have to check that the diameter is correct to fit over the inner cardboard tube. 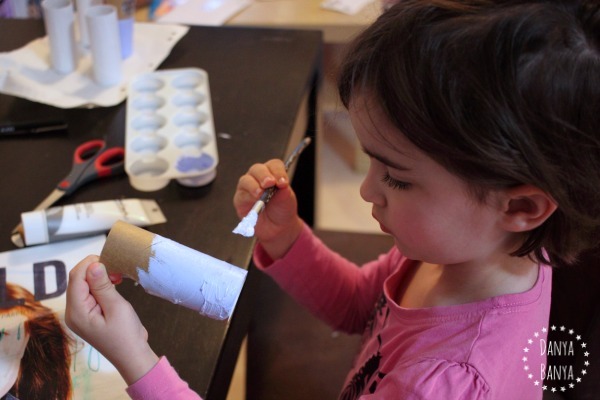 Cut a facial hole in your TP roll, and then paint on a dress using acrylic paint. You can choose whatever colour you like, but I always think of Little Bo Peep as wearing a baby blue dress with a white apron, so I mixed dark blue and white until it reached a baby blue shade. JJ and I crafted alongside each other as usual. I made Little Bo Peep. 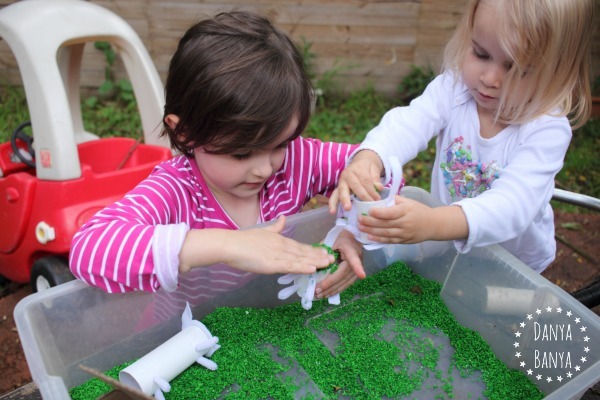 JJ (4 years and 10 months) explained she was making Little Bo Peep’s mother, who is called ‘Holly’. 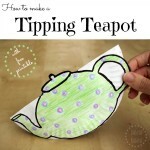 Acrylic paint is thicker and oilier than water-based paint, and is perfect for this craft. It paints on easily, with nice strong colours, and doesn’t make the cardboard soggy. 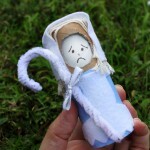 Once it is dry, it acts as a mild protective barrier, enabling the doll to withstand gentle play. I usually buy acrylic paints from our local discount store. There are lots on Amazon too. 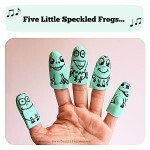 Just be careful if you have a little person helping though, as acrylics don’t wash off easily. While you have the acrylics out, paint a few TP rolls white as we’ll use these to make sheep later on. When your paint has dried, cut out a rectangle shape (which will become the bonnet) and an apron from white felt (or other white fabric). Also cut a few dozen strands of kitchen twine for hair. If you don’t have kitchen twine, you could also use wool (or yarn). Stick on with craft glue. The bonnet was the trickiest bit: you’ll need to apply pressure whilst it dries, but without squashing the circular shape of the TP roll. 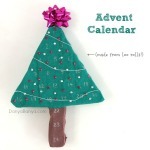 I found that tying on a few pieces of extra twine helped. I left it to dry overnight, and cut the extra twine off the next day. 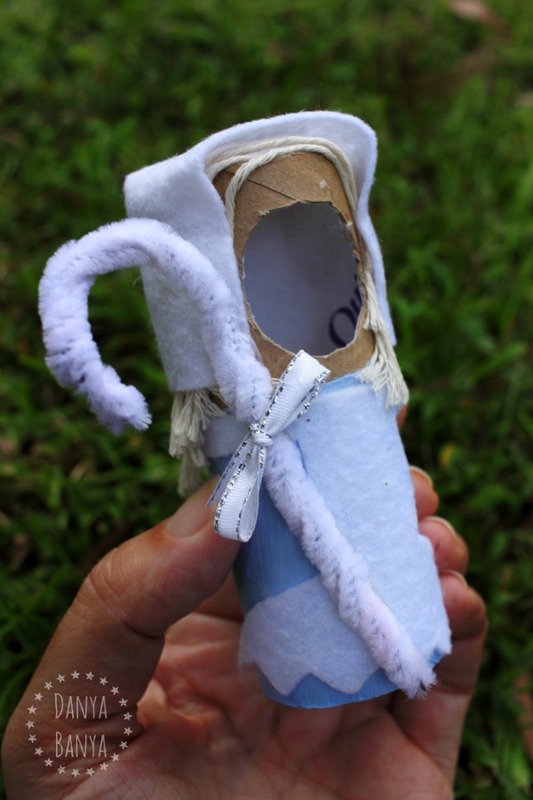 The next step is to make Little Bo Peep’s shepherd’s crook. I used a (chenille stem) pipe cleaner, which I doubled over and then twisted to make a thicker shorter stem, which I then bent into a classic shepherd’s crook shape. A tiny ribbon bow adds a bit of flair. I attached the crook with my trusty low temperature glue gun, but if you don’t have one, craft glue should work for this part too. Our inner emotional tubes are starting to look slightly frazzled, which is understandable after 1.5 years of play. Pretty good seeing as they cost, umm, nothing! But I digress. 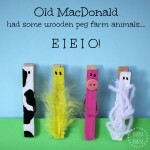 Let’s get back to poor Little Bo Peep! Shall we make her some sheep? 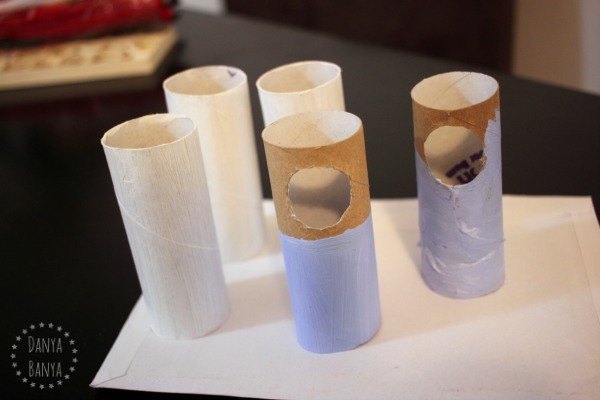 Paint toilet paper rolls with white acrylic paint (or you can skip this step if you already did it earlier). Cut one of the rolls in half to make two smaller rolls, which will be two lambs. JJ also asked to make a ewe, so we left another roll full size. 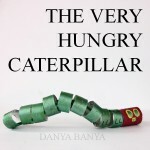 To make a set of four legs, cut a pipe cleaner into two halves. Then fold the ends in to meet at the middle and twist until attached. You should now have two feet (or hooves) with rounded ends, and the sharper pipecleaner ends should be twisted together in the middle. Repeat. 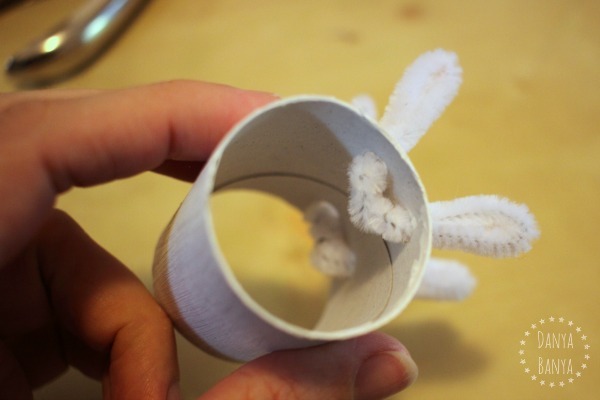 Then feed the four hooves through the holepunched holes from the inside of the tube out. Cut out a long tail from white felt, and staple on to the back of the lamb. The tail should be long enough so that you can make it wag. 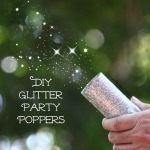 (If you don’t have a stapler handy, you could also glue this on). 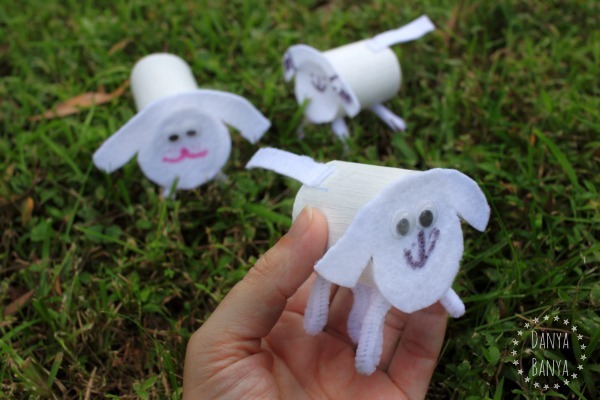 Add any extra facial details with permanent marker, and you have some cute little toilet paper roll lambs with tails to wag! As a side note: we’ve been learning about the Australian sheep industry, and how Aussie farmers cut the tails off lambs when they are old enough, because of our fly situation. We decided our lambs were still little babies who haven’t had their tails cut off yet, but of course our mother ewe sheep is tailless. And so back to our story. 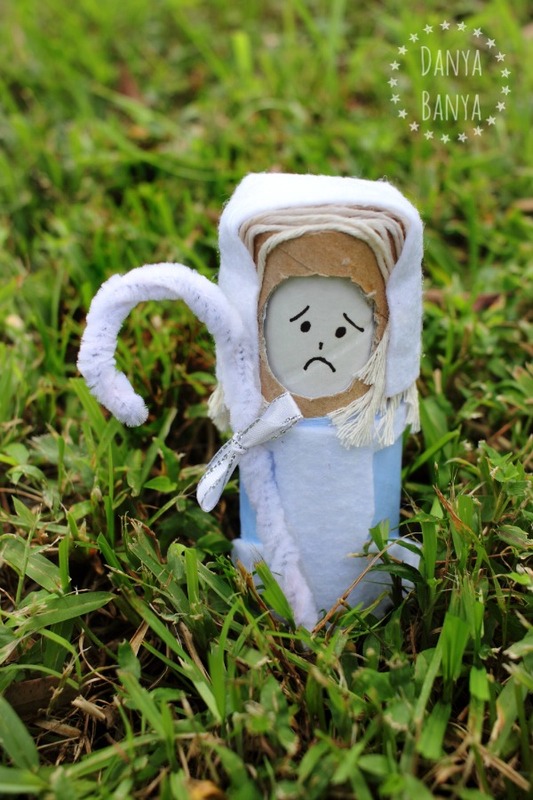 Here is Little Bo Peep, incredibly worried because she’s lost her sheep. Awww. But don’t worry, here they are reunited again. All smiles! 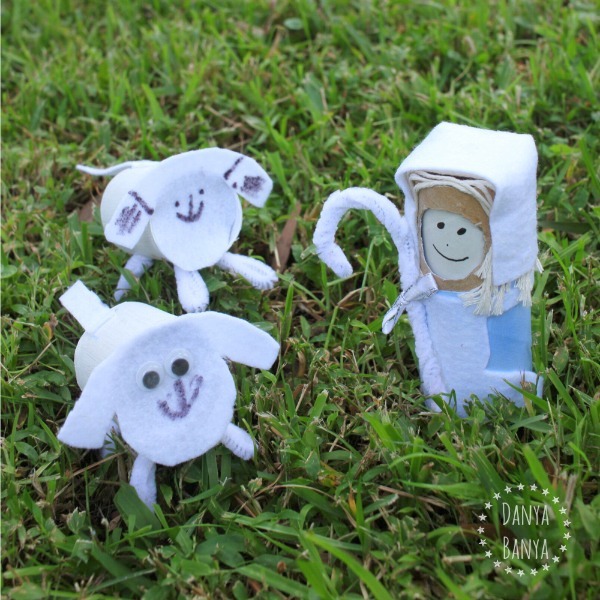 I set out a little small world Little Bo Peep play scene, to encourage imaginative play. I just using an under-bed storage container, the green rice we dyed a few weeks ago for grass and a DIY cardboard barn. The kids loved it! They soon discovered that they could fill the back of the TP roll lambs (either by picking up the grains of rice with their fingers, or by scooping the rice up with the TP roll lambs themselves). In this way, the lambs could ‘eat’ the grass. Nom nom nom! And of course, what goes in, must come out. If they tipped the lambs over, they could poo (or pour) the rice back into the container again. This was apparently hilarious, and was repeated x100 with lots of giggles. 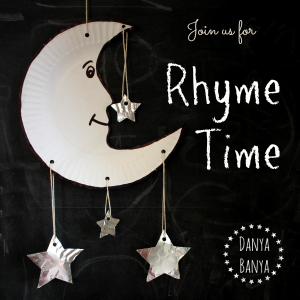 And the best bit about Rhyme Time, is that you don’t just get MY Little Bo Peep idea, you also get FIVE more from some of my blogging friends! Each idea is new, and different, and lots of fun! 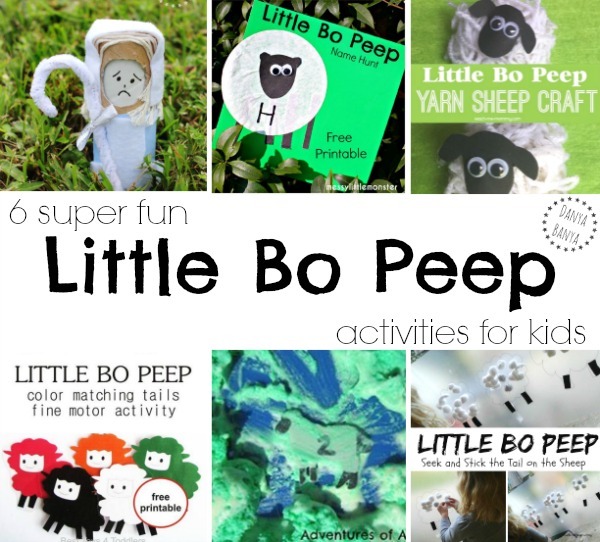 or go on a Little Bo Peep name hunt with Messy Little Monster. 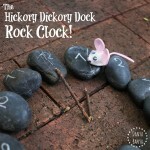 These activities (and lots more fun nursery rhyme ideas for kids too) are all pinned to our Rhyme Time Pinterest board. 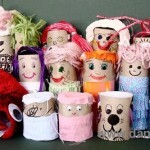 Or if you are interested in more toilet paper roll activities, then we probably have a shared obsession. 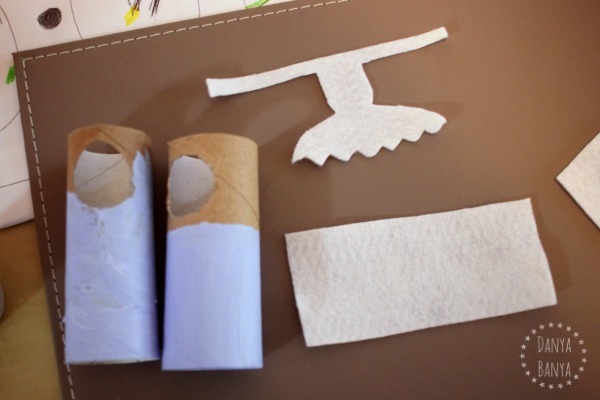 Here’s just a few of our favourite TP roll ideas that we’ve done on Danya Banya. (Click on the picture to go to the full post). Haha, there’s quite a few (and this isn’t even all of them)! 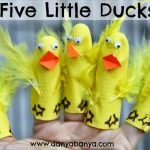 Follow Danya Banya | Go Science Girls’s board Loo (and other Cardboard) Rolls! on Pinterest. Congrats Cass, and enjoy shopping!